Motorola Genuine SPN5970A 3A Turbo Power AC Power Supply Charger Original !!! Our product is 100% Genuine and New. 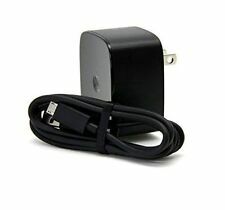 4.5 out of 5 stars - Motorola Genuine SPN5970A 3A Turbo Power AC Power Supply Charger Original !!! 8 product ratings8 product ratings - Motorola Genuine SPN5970A 3A Turbo Power AC Power Supply Charger Original !!! Motorola Droid Turbo. Motorola Moto X. Motorola Moto X Pure. 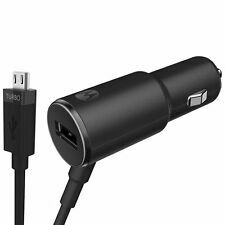 Includes a 3.3ft detachable micro USB to USB charging cable. Motorola Turbo 2. Motorola Ultra. Motorola G3. Motorola G4. Smart phones with micro USB port. Numbers of USB. Quality & Efficiency and Speedy with fast charging. Output cable. 5V-2.85A /9V-2.85A /12V-2.85A (max charging power 24W). Buy 3 get 1 for free. IC cuicut, safe production for your charging. OVER AND OVER. • ONE FOR ALL. REST EASY. • HIGH ENERGY EFFICIENCY. High energy efficiency level VI. Features include PVC free, BRFs free, lead free, Phthalates free and RoHS compliant. Moto Z Family, Moto Mods, Moto G6 plus, G6, Moto X4, Moto M, Samsung, LG, Huawei and any Android USB-C compatible smartphone/tablet. 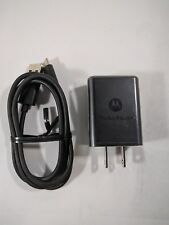 Motorola Genuine 3A Turbo Power AC Power Supply Charger Original !!! 5 out of 5 stars - Motorola Genuine 3A Turbo Power AC Power Supply Charger Original !!! 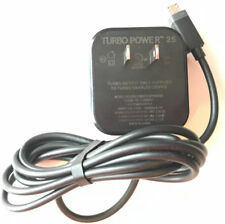 16 product ratings16 product ratings - Motorola Genuine 3A Turbo Power AC Power Supply Charger Original !!! Trending at $15.48eBay determines this price through a machine learned model of the product's sale prices within the last 90 days. Moto G5, E4, E4 Plus, G4 Play. What You Get. SKU: MOT-SPN5504A-A2. Compatible With Motorola Droid Turbo 2, Droid Edition, Moto G⁴ Plus, Moto X Pure Edition, Droid Turbo 2, Droid Maxx 2, Moto G⁴, Moto E (2nd Gen.), Droid Razr Maxx, Droid X2, Moto X. Give your compatible Motorola phone 10 to 13 hours of battery life in just 15 minutes of charging. I am not the original owner of this item, and unless it is listed as NEW, it should be considered USED.